As partygoers downed champagne, a spacecraft swept past a mysterious object 4 billion miles from Earth. After Pluto was discovered, in 1930, astronomers wondered whether the solar system stopped there. For decades, they peered through their best telescopes, searching for hints of more objects in the darkness. In the early 1990s, when telescope technology became powerful enough, they found one. The object was thousands of times fainter than Pluto, but it was there. A few months later, they found another. And then another. And another. With each new discovery, the edges of the solar system expanded. More than 3,100 similar objects have been found in this cold, dark region, known as the Kuiper Belt, named for an astronomer who predicted their existence. On New Year’s Eve, for the first time, one of these objects received a visitor. At exactly 12:33 a.m. Eastern time, as people on the East Coast drained their champagne glasses, a NASA spacecraft about the size of a grand piano approached a Kuiper Belt object about the size of a city. The object was 2014 MU69, which NASA has nicknamed Ultima Thule, an ancient phrase meaning “beyond the known world.” Ultima Thule orbits about 4 billion miles from Earth, making this the most distant encounter with another celestial object in the history of space exploration. Like New Year’s revelers back on Earth, the spacecraft, known as New Horizons, snapped many photographs to capture the experience. And it had to do it fast. This mission was a flyby, not a visit, and Ultima Thule, measuring just 20 miles long and 10 miles wide, was a difficult mark to hit. New Horizons came within 2,200 miles of Ultima Thule’s surface. Then, traveling at a brisk pace of 32,000 miles an hour, the spacecraft left as quickly as it arrived, continuing on to the very ends of the solar system. At a distance of 4 billion miles, it takes some time for data from New Horizons to reach Earth. The spacecraft called home for the first time since the flyby on Tuesday morning. Engineers reported that systems were working properly and packed with tantalizing new data. Scientists plan to unveil the first close-up images of Ultima Thule on Wednesday. On Tuesday night, a Newsweek story from March kicked off a discussion on social media about NASA’s decision to use the name Ultima Thule, one of thousands of entries to a public naming contest. The term first originated more than 2,000 years ago with the Roman poet Virgil and has appeared in literature as a descriptor for distant places. Newsweek reported that the term was also popularized by the Nazi party and remains in use by modern-day white nationalist groups. Ten hours earlier, on Monday night, hundreds gathered at the Johns Hopkins University Applied Physics Laboratory, in Maryland, where New Horizons was built, to celebrate the flyby. The mood was festive. There was cheese and crackers, glittery party hats and kazoos. String lights draped across the walls gave the room a soft glow. It felt like any other New Year’s Eve soiree, except it was clearly obvious that no one actually cared about New Year’s Eve. Brian May—the curly-haired lead guitarist for Queen who became a professional astrophysicist about a decade ago—debuted a recording of a song he wrote specifically for New Horizons. Guests cheered with more enthusiasm for the flyby than they did for the arrival of 2019. All night, scientists buzzed about what sights New Horizons may reveal. From Earth, these objects look like tiny pinpricks of light. The faint glint can be used to calculate the objects’ orbits, but little else. Scientists think that Ultima Thule, like most Kuiper Belt objects, is icy. They suspect it will likely be reddish in color, thanks to billions of years of exposure to the radiation that permeates space. 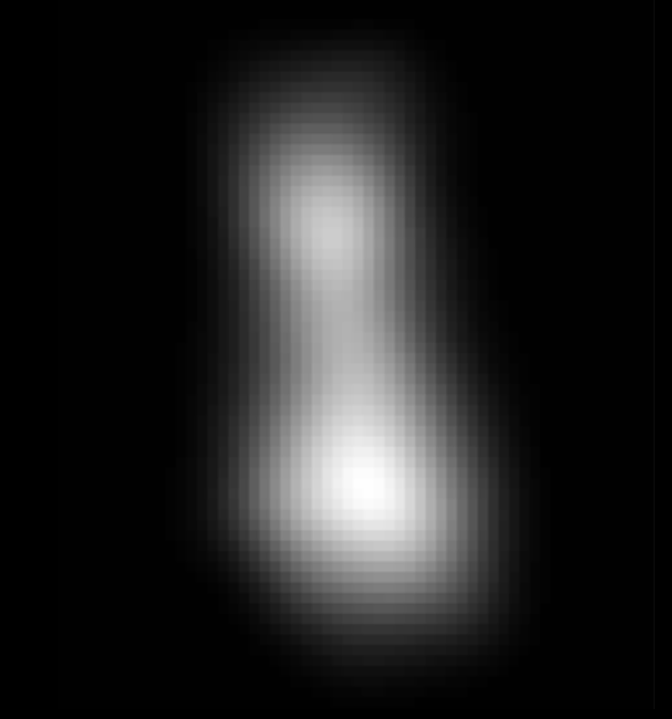 They don’t even know whether it’s one object or two; Ultima Thule could be two objects orbiting in close contact as one, or two objects orbiting each other. It’s happened before. New Horizons left Earth in 2006, eight years before Ultima Thule was even discovered. In 2015, the spacecraft swept past Pluto. The encounter produced unprecedented observations of the dwarf planet, which lost its status as a full-fledged planet in 2006, a demotion its fans fulminate against to this day. The images revealed, in tremendous detail, 11,000-foot mountain ranges made of ice and smooth plains of frozen nitrogen. Some land features suggested that Pluto may even be geologically active. “There were things on Pluto that we never would have guessed were there, because they’re literally only on Pluto,” Singer said. Scientists hope their observations of Ultima Thule will provide new information about the formation of the solar system 4.5 billion years ago. Objects in the Kuiper Belt are cosmic leftovers, remnants of a tumultuous process that swept some debris into planets and scattered the rest. Thanks to their distance from the sun, the objects orbit in an extremely cold environment that has left them virtually unchanged for billions of years. This means they contain the same materials that formed the planets. For planetary scientists, Ultima Thule is a cosmic time capsule in pristine shape. For now, the arrival is thrilling enough. The New Horizons team has waited three and a half years for the spacecraft to approach Ultima Thule. Scientists have had plenty of time to daydream about the object’s landforms and make their predictions. And they’re well aware that they may be wrong.